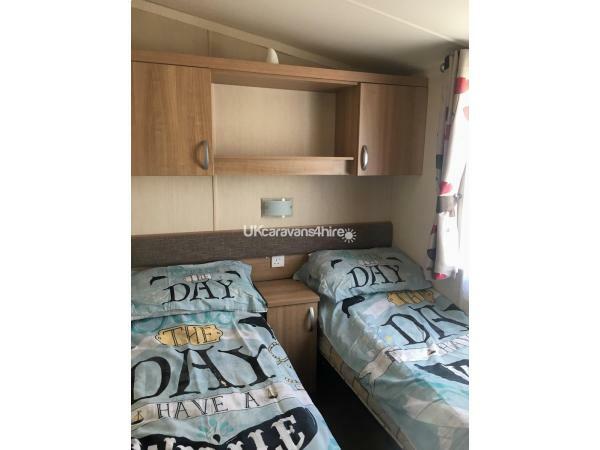 We are pleased to introduceThis Swift Bordeaux 2014 Prestige caravan is an 8 berth caravan which consists of a main bedroom with a double bed,TV and on suite toilet over head side cupboards, bedside cupboards, double wardrobe, dressing table with a under counter stall and a drawer. There area two twin bedrooms both of which have two singles beds, One of the twin rooms both beds can be put side by side and made into a double, this room also contains the iron and ironing board on top of the cupboards above the bed, both twin rooms have above the bed cupboards and a single wardrobe. Under the settee in the lounge is a further pull out double bed. 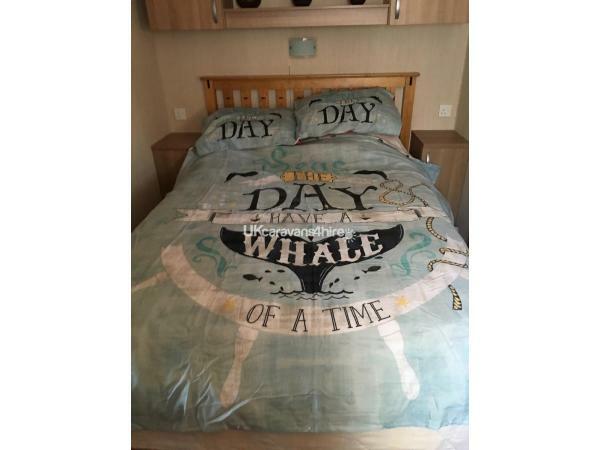 ALL DUVETS AND PILLOWS ARE PROVIDED BUT YOU WILL HAVE TO SUPPLY YOUR OWN BED LINED AND TOWELS. 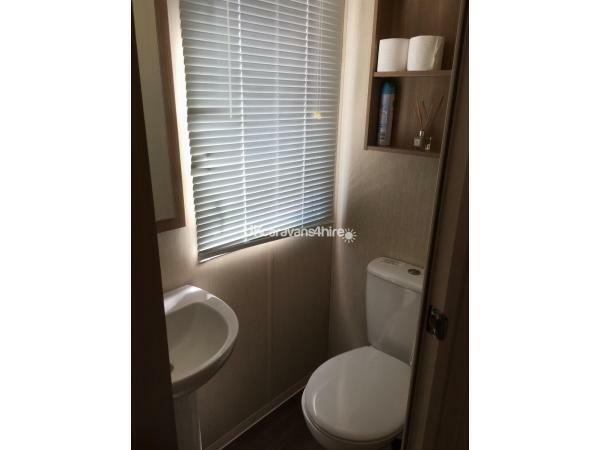 The caravan has a separate shower room and toilet both with sinks. 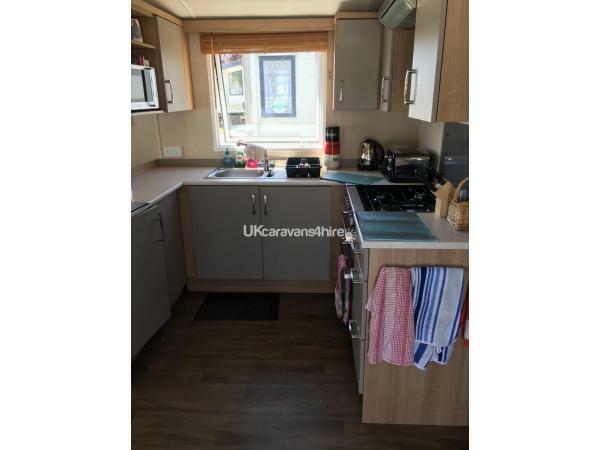 The caravan is fitted with double glazing and gas central heating through out and is fully fitted with a gas cooker, microwave, fridge freezer, kettle, toaster, all crockery, cutlery, saucepans that you will need. 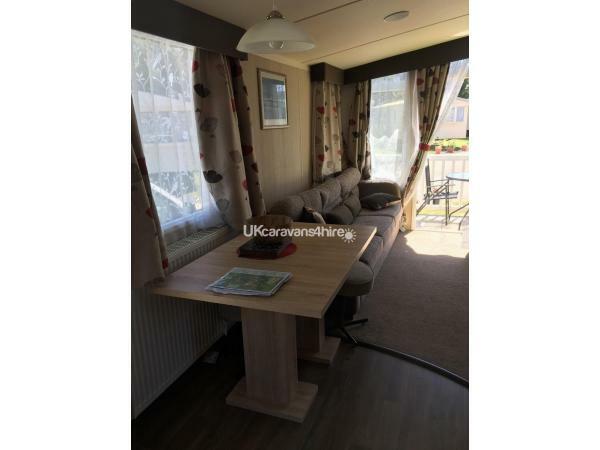 The caravan itself has its own parking space and a patio area with a garden bench,and can be located at the bottom of the park in Meadow Bank. 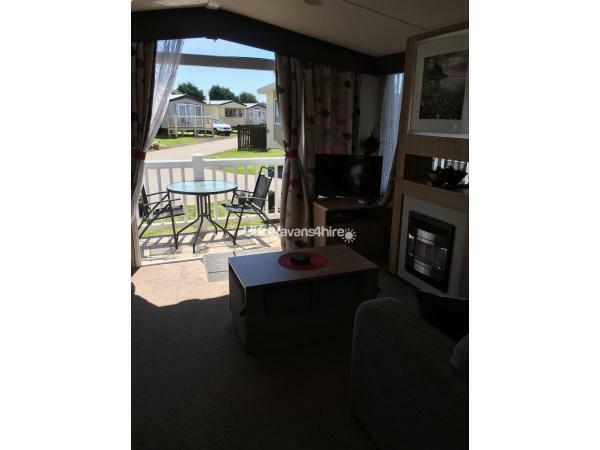 There is no smoking allowed in the caravan due to site rules, you may smoke on the bench on the patio and we ask that you dis guard of your cigarette butts safely and DO NOT place these in the plant pots supplied if found this will affect your deposit and this will not be refunded. 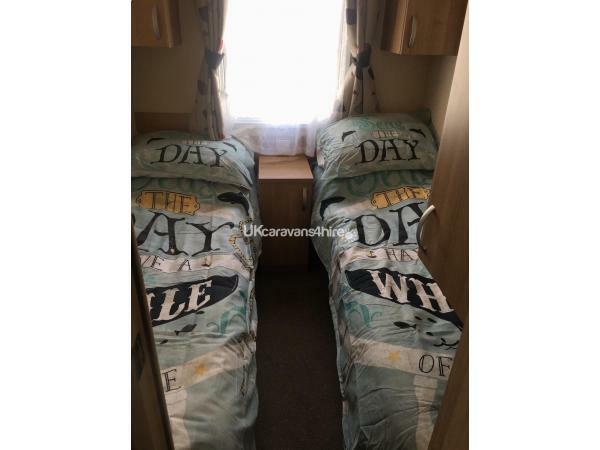 Pets are not allowed in the caravan due to owners health issues if you are found with a pet in the caravan you will be asked to leave and will not be refunded. Gas and electric is included in the price. Passes are not included in the price as you do not need them to access all parts on site. These can be purchased from the reception if needed or we can organize these for you but payment will be needed in advance so you collect these on your arrival on site. Full balance is payable 6 weeks prior to the holiday. May we take this opportunity to thank you for looking at our caravan. Additional Info: Combe Haven have a cafe bar that supplies excellent food and also a Burger King and Papa Johns. There are lots of amusements and pool tables to keep the whole family busy all day in the top arcade and an indoor and outdoor pool which are both heated and have been revamped in recent years to include a large SPACE BOWL FLUME,There is also a pitch and putt onsite and a sports Dome were sports activity's can be booked. 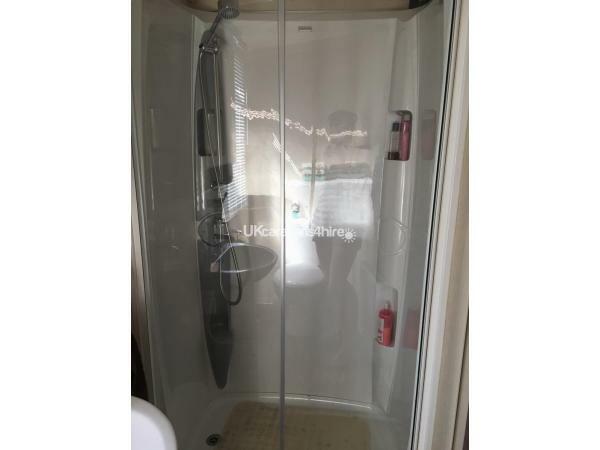 Lovely clean peaceful caravan. Own parking space. Outdoor seating. Lovely balcony decking which was perfect with the current heatwave. 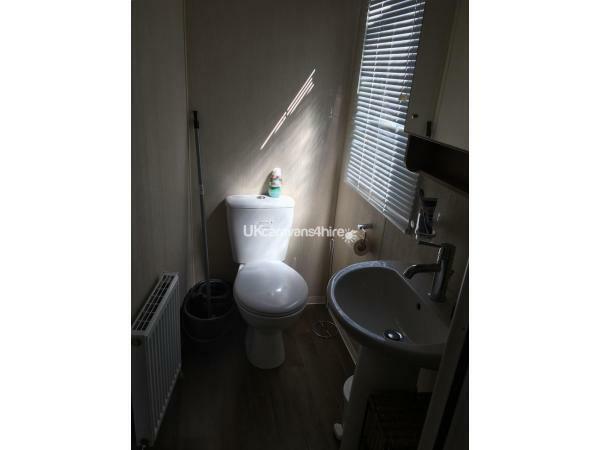 2 toilets (handy with 3 teenagers). We look forward to booking this caravan again in the future. Only thing that was missing was a potato masher lol, thanks for a lovely stay. 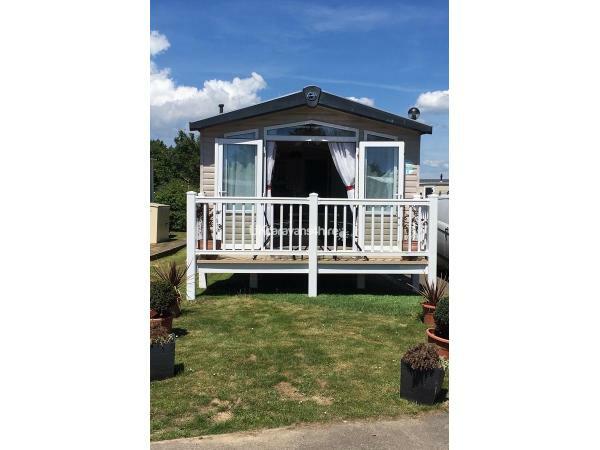 We had a brilliant stay in this caravan, it looks lovely and facilities were great. Owner easy to deal with too. Would book again. Spent 2 1/2 weeks in this caravan and wished it was longer!!! 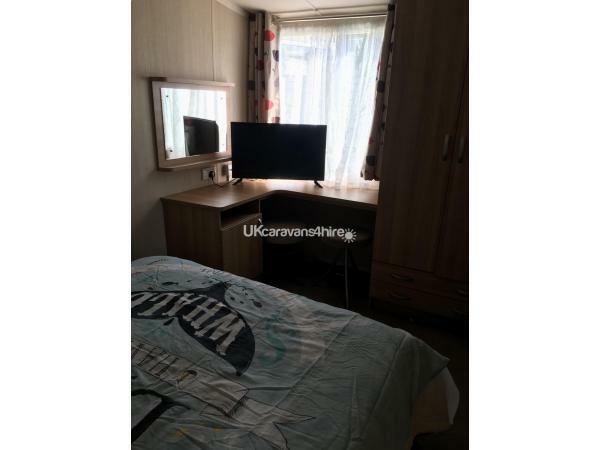 The caravan is beautiful with great facilities. With 5 young children it's great to have a full sized freezer!!! Lovely welcome package left for arrival. Definitely has the home from home feel whilst still feeling like a holiday. Can't wait to book this caravan again.